The DFA Cash Tray is a transaction tray designed and developed by Ideas, specifically for dual height customer counters, to allow both ambulant standing and those seated in a wheelchair, or of lower stature, to access the same customer sales counter. The DFA Cash Tray removes the need to build dedicated sales positions that are often referred to as the ‘DDA or disabled window’ and are vacant the majority of the time. For multiple transaction windows, it allows for all positions to be accessible and helps remove the stigma associated with disability and impairment. Customer counters are accessible for all. A discrete solution that is both functional and attractive. Easily operated by staff and customer use. All sales positions are accessible. No need for a dedicated ‘DDA or disabled’ position. Maximise on the available space that would have required a dedicated ‘DDA or disabled’ position. Choose from our ready-made solutions for your customer counters or security windows project. All are developed using “Ideas” design principles and focus on safety and ergonomics. Security windows and screens, ensuring employee safety. Sound systems and cash drawers, integrating accessibility and ergonomics. Modular pay counters, customer information points and control rooms. 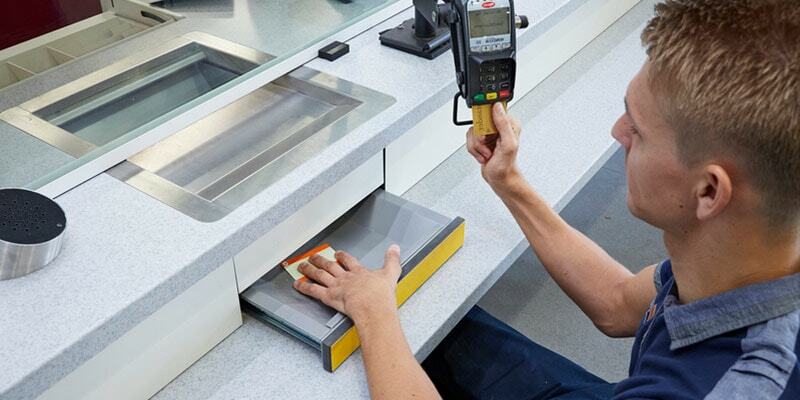 Faced with a complex challenge, you need the best advice and the most innovative solutions, at any stage of your customer counters or security windows project. Your team and our experts - working together to achieve the best results. Benefit from our innovative ergonomics and integrated solutions. Rest easy. We are the industry experts, so compliance is guaranteed. Eliminate your worries by using our one- stop shop service for your customer counters or security windows. That’s everything from concept to design, manufacture and installation. Aesthetics and future proofing concepts. A guarantee you’ll meet or exceed industry standards. Crucially, you’ll get a faster project completion and sign-off.